Being “fit for life” might sound like a figurative expression, but Street League in the UK has discovered though the MOVE project that it is literally an advantage to be physically fit to take on life’s challenges and succeed. 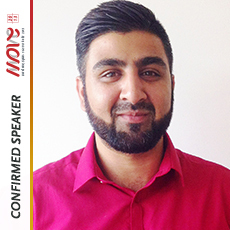 At the MOVE Congress last year Rizwan Aboo showed that focusing on the link between young people’s fitness and their prospects in employment, education and training has added an extra dimension to Street League’s football and education academy. Street League set out in 2001 to help homeless people, and now hard-to-reach youth aged from 16-25 to get into employment and education through a structured, eight-week programme combining vocational education workshops with football training sessions. The non-profit organisation had already helped over 22,000 youth, both male and female, to get into regular employment, education and training when it joined the MOVE project. It had also gained support from the British Prime Minister’s office. But something wasn’t working and Street League’s Employer Engagement Manager, Rizwan Aboo, could sense it during the workshops. “There was a lack of concentration in the classroom; there was a lack of attendance and disengagement from our progression services. The young people weren’t really interested in them and it was really difficult to work with some of the young people with the challenges and barriers they faced,” he said at the MOVE Congress. Aboo said he noticed it was easier to attract, retain and find employment or training for young people who were fit and enthusiastic, but it was notoriously difficult to reach youth who didn’t engage in anything at all – especially physical activity. Funding from the MOVE project provided money for the facilities and equipment to conduct fitness tests at the beginning and end of each round of the Street League Academy. The results gave the organisers an even greater incentive to focus on participants who were demonstrating low fitness levels. “We ran fitness tests in our academies between October 2012 and March 2013 and that gave us an idea to see whether there was a link between improving fitness and the young people’s outcomes: Do young people, if they become fitter and healthier, get into a positive outcome compared to someone who isn’t as fit and healthy? So that’s what we did in the MOVE project,” Aboo said. Both the overall numbers and the individual cases from the Street League Academy during the MOVE project offered compelling evidence of the positive relationship between fitness and engagement. All of the 79 participants who went through the programme during the project improved their fitness and this positive result flowed on to their attendance, punctuality, attention and attitude. Two-thirds of the participants who scored well in the fitness tests or improved their fitness were soon placed in employment or education. Aboo acknowledges that there are some factors in the participants’ lives that are difficult to overcome, such as lack of accommodation, financial difficulties, family issues and negative attitudes, which can still get in the way of their progress even if they get into better physical shape. But he still believes that the positive results he has seen throughout the project, including watching some of the participants turn into mentors for their peers, has meant that Street League’s fitness experiment was a success. The MOVE project is set to have a lasting impact on the Street League Academy, which will continue to include heart rate, bleep tests and cooper runs as part of its programme. Street League is also aiming to expand its Academies throughout the UK and help 2000 young people each year to get into employment, education and training pathways. “The plan for Street League is that we’re in seven cities at the moment and we plan to be in 12 cities by the end of 2014. Hopefully what we’re going to start doing, slowly but surely, is introduce fitness testing at the start and the end of all of our programmes to really measure their fitness. So that’s how the legacy of the MOVE project is going to continue in our organisation,” Aboo said. Street League announced in February that it has already opened three new centres and is recruiting staff to open five more centres over the next few months.